Make the pallet fall in love with intelligent manufacturing just need only 3 reasons! 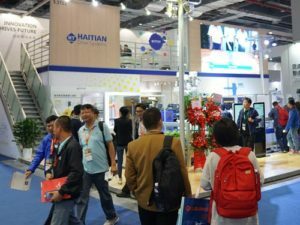 The 2018Chinaplas International Rubber&Plastics Exhibition has successfully ended on April 27. Haitian Drive System thanks every friend for visiting and guiding. We are here to invite you to participate the 2019Chinaplas and see you in Guangzhou next year! CCMT2018 The Tenth China CNC Machine Tool Fair will be held from April 9 to April 13 in Shanghai New International Expo Center. The Motor Project of Ningbo Anxin Numerical Control Technology Co., Ltd. was approved as “Demonstration Project of Industrial Transformation and Upgrade and Foundation Enhancement Project in 2014 ”. The project of Ningbo Hilectro Precision Machinery Manufacturing Co., Ltd. was approved for Technology Innovation Fund by the Ministry of Science and Technology. Hilectro electric forklift truck participated in Guangzhou Forklift truck and Accessories Exhibition. The Hilectro station mounted pallet stacker was put into mass production.